"Where do I begin when I want to feed my family healthy food?" That was the question I asked myself when I started researching real food. Between knowing what real food was (and wasn't), staying within the budget AND cooking meals that my family enjoyed, I was overwhelmed and ready to quit before I even began. Then I took a deep breath and thought of just one thing I could do today that would make a difference. I did the same thing the next day... and the next day, and step by step later, I was more confident about the goals I set for my family and how we were going to achieve them. I compiled the first five steps so I can help others with knowing where to begin with healthy eating. This challenge will hold you by the hand as you clean out your pantry, reduce food waste, simplify meals, and choose real foods for your family. You'll learn step-by-step ways to a cleaner kitchen and leaner grocery budget. 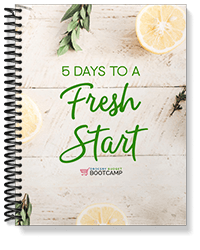 In less than a week you can have a Fresh Start that will change your life. It would have been so much easier if I had this guide to help me out, so let this be my gift to you. Subscribe to my weekly newsletter and I'll deliver 5 Days to a Fresh Start straight to your inbox! Success! Check your email for your course - it should arrive soon! Here on the Crumbs blog you'll find simple, practical ways to feed your family real food and live a healthier lifestyle, without going broke in the process. I’ve walked the journey to real food and natural living over the last few years. Along the way I’ve learned a lot about what healthy eating really is and how to live a simple, natural lifestyle. I share what works when it comes to frugal real food eating, and I encourage you to join the positive and upbeat Crumbs community as we all walk this journey of eating real food on a budget. While I don't consider myself skilled in a lot of things, I do have a great deal of experience when it comes to eating real food on a budget. So much so, that I've created an eCourse designed to help you connect the dots between budgeting, grocery shopping, and eating real food. You can read more about Grocery Budget Bootcamp HERE. No matter what stage you are at in your real food journey or how your finances look, Crumbs is a place where you can find practical real life ideas to make the next step. I’m so excited for you to join us!